Fifteen years I've been in the trucking industry, and if I could just have a fraction of a penny for every time I've heard "Safety is our number one priority" I have not a single need. I'd have enough money to last me two lifetimes. The phrase is plastered on break room walls and throughout company literature. It's nearly everywhere you turn. Millions of dollars are spent on "loss prevention" and "accident awareness training." It's all bogus. Every. Single. Word. No parking. No idling. No sleeping. 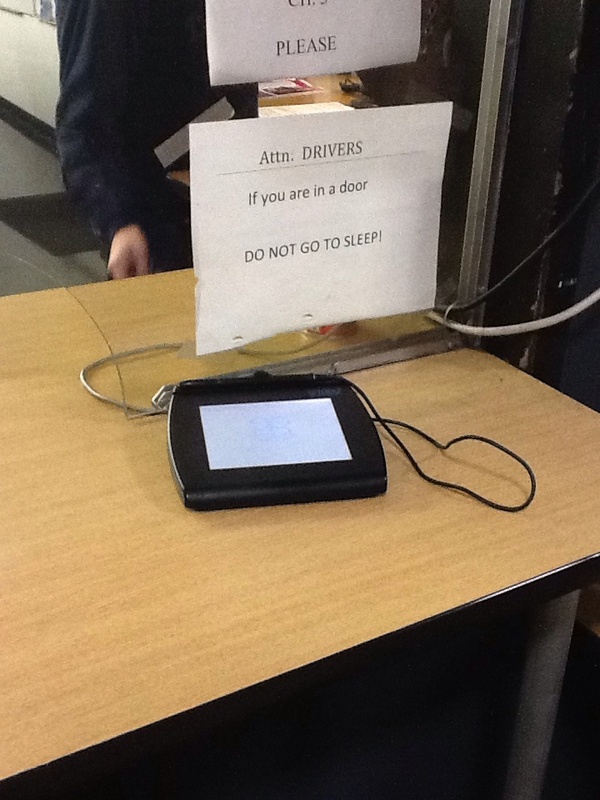 A sign at a receiver. If we actually considered safety a top priority, we would honor the most sacred of time periods - rest breaks. I can't even begin to count the number of times I've been awakened by security guards, policemen, or property owners and told to leave. "But I'm out of hours. I'm not legally allowed to drive." "Doesn't matter. Move now or face fines or forcible removal." It DOES matter. It matters a lot. A commercial driver lives in his or her truck. There is no where else to go in many situations. I live wherever I am, and I am (supposedly) bound by Federal law concerning my rest breaks. If I am caught or have an accident when I should be resting, I can lose my ability to earn a living for my family. Tonight is just the most recent example of this. I had a load to deliver at a Walmart Distribution Center in Smyrna, Delaware. I was told I had a 5:00 pm appointment. I arrived at 5:07 pm after being delayed the night before by heavy snow. Along the way I also had to address a plugged fuel filter. Even still, I arrived inside the allowable window to get unloaded. I was told it was a drop, not a live unload. I searched for an empty trailer, but none were available. I notified dispatch and was told not to leave. I was already planned on another load for a different customer tomorrow with set appointments. I had to find a way to satisfy both requirements. I would take my 10 hour break by which time my trailer should be unloaded and I could make my next load. Before I went to bed I decided to check in again and see what the progress was on my trailer. It was then we found a mistake was made. "Oh, this is a one-hour guarantee." Apologies were offered and so I said, "I'm out of hours. I'll need to finish my break, so will my trailer by done by 4:00 am?" The answer was yes and so I prepared to go to bed. I called and hastily said goodnight to my wife and children so I could still get about 7 hours of sleep. That was at 9:41 pm. The call lasted one minute. At 11:45 there was knock at my door. I was disoriented as I got up and rolled down the window. "I'm trying to figure out what you're doing here." I told him I was waiting for my trailer. I was told that isn't allowed. "Only Walmart trucks are allowed to sleep. We don't have sleeping on the yard." I informed him that I had already spoken to the lady inside and what the arrangement was (or what I thought it was.) He was very rude and abrasive. He woke me from a dead sleep. I'm sure I wasn't as polite as I could have been. He tells me to come back tomorrow. I asked "What time" and he became further enraged. He goes inside and comes back. "No sleeping. Leave now or I will have you banned from all Walmart properties. I will be back through here in 10 minutes and if you're not gone I will call the police and have you forcibly removed." We then went inside where the lady I had talked to lied to him and me when she said, "You asked if you could stay here and I said no." That was a complete and total fabrication. I said, "I'll admit we weren't clear. I said I was going to sleep and nothing was said that I couldn't stay here." I left. Out of hours and exhausted, I drove away. It wasn't the first time and it certainly won't be the last. So let's think for a second what would've happened if when I pulled out on the road someone in a car hit me. It's happened time and again that even if the driver of the car had been at fault, I would have been cited possibly even put in prison because I was driving illegally. Lawyers have argued (and won) "Had the driver not been on the road at that time, the accident wouldn't have happened." There are truck drivers IN PRISON today for fatal accidents caused by drunk drivers, usually the drunk was the one killed, where the driver was either not logging accurately or was over their time and was then found to be at fault because "they shouldn't have been there to be hit." A driver's rest break should be sacred and uninterruptible. Period. For those of you so captivated by writing new laws, here's an idea for you - It should be punishable by imprisonment for waking a driver during his rest break. Certainly if a driver is trespassing on private property or parked in an unsafe location there should be an exception. But if a driver has leegitimate business at a location, there should be no circumstance where he is awakened and forced to leave. This isn't about Walmart. I've been run off from a Target DC as well. I love how people are so quick to criticize Walmart when Target and other retailers are flip sides of the same coin. This problem is much worse when pulling a van or reefer trailer. It's one of the things I miss the most about pulling flatbed. They're happy to see you when you get there and they unload you quickly. Usually you're hauling something on a flatbed that they need to build something with. I can testify that I am treated with much more respect as a driver when I'm pulling a flatbed. The government is no help either. They write these ridiculous anti-idling laws that tell me I am to shut off my engine regardless if it is 10° or 100°. I don't have $8,000 to spend on an APU, and I will not accept money stolen from other citizens in the form of a grant or tax credit to buy one. I'll get one when I can afford it. Until then, my engine provides my heat and air conditioning and it will run when necessary to keep me comfortable. Safety. What a joke. If any one if you cared about safety, you'd let me rest. Posted on December 19, 2013 by Chris Polk and tagged Safety labor business OOIDA Owner operator Rest ban United States Drivers freedom Carriers Trucking government carrier Freight.